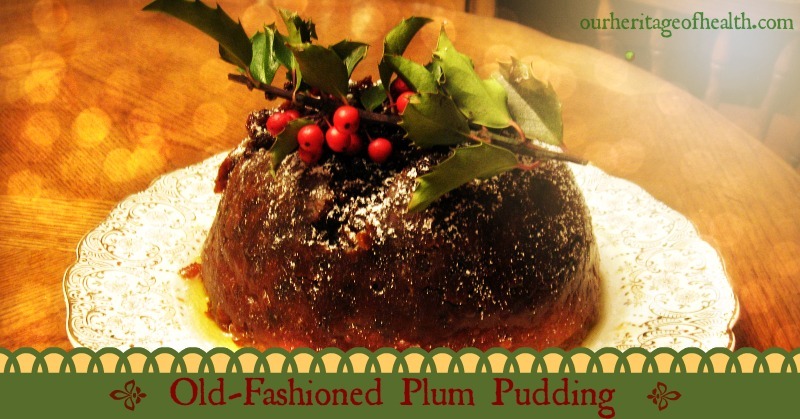 Made famous by Dickens’ A Christmas Carol, plum pudding is one of those quintessential holiday desserts that will forever be associated with the Christmas season. For many of us, though, plum pudding is one of those holiday traditions that we see in holiday movies or read about in books, but have never actually tasted ourselves. And just like old-fashioned fruitcake, plum pudding is often misunderstood. Up until two years ago, I had always though that plum pudding was made out of actual plums. It wasn’t until I started collecting 19th century cookbooks and found recipes for traditional plum pudding that I realized that there weren’t actually any plums in plum pudding at all! * Though the original recipe calls for suet, I substituted butter because I don’t have access to a source of good-quality suet right now. Coconut oil can make a good substitute for butter, too. If you have suet available to you, though, it would make for the most authentic plum pudding. In order to use the suet, you would simply mince it into small pieces and mix it in with the rest of the batter. * You can usually find candied citron at the grocery store during the holiday season, but I prefer to make my own to avoid the extra preservatives and artificial colorings in most store-bought citron. To make my candied citron, I followed the directions outlined here. * I substituted lemon juice for the brandy, but if you decide to use brandy, simply mix it in with the rest of the ingredients. In a large mixing bowl, cream together softened butter and sugar. Beat eggs lightly until they are foamy, and combine with the butter-sugar mixture. Add the lemon juice or brandy, the nutmeg, and the allspice and stir until combined. Gradually add flour, stirring until fully combined. Fold in the fruit until well incorporated with the other ingredients. Puddings can be a tad bit tricky (hence Mrs. Cratchet’s trepidation that the pudding might not turn out), and they require a time when you will be home for about 6 hours and able to come into the kitchen to check on the water level every so often, but when they turn out right, they are well worth the effort! Traditionally, puddings were either wrapped in an oiled cloth and submerged into a pot of boiling water, or they were put into special pudding molds. The method of steaming a pudding that I typically use follows the same basic idea as the old-fashioned versions, but it’s a little bit simpler and doesn’t require any special cloths or molds. I used the process shown in this video to steam my pudding in a bowl rather than a cloth or a mold. Grease a bowl large enough to put your pudding in, making sure it is well coated so that the pudding won’t stick to it when you are ready to un-mold it later on. Then wrap the bowl in the aluminum foil and secure it with the string as shown in the video. The key is to tie the string as tightly as possible and to make sure the foil is folded so that you have a water-tight seal, because if any water gets inside the bowl, you’ll end up with a very soggy pudding! Heat a large kettle or pot of water until it reaches the boiling point. You want it to be a steady boil, but you don’t want it to be a really strong rolling boil that could splash around enough to soak into your pudding. You want the water to be more than half-way up the side of the bowl that your pudding is in, but you don’t want it to be so high that it is all the way at the top or so that the pudding is submerged. Every half hour or so (or anytime you happen to be walking through the kitchen), check the water level to make sure that it hasn’t gotten too low, and add more hot water if necessary. The first time I made a pudding, I made the mistake of letting the water level get too low for too long, and my pudding ended up fully cooked on the bottom and not done yet on the top. After six hours, the pudding should be done and ready to take out of the water. Using the string handle, carefully lift the pudding from the water and set it aside to cool. Serve the pudding with sauce, if desired and enjoy a taste of traditional Christmas cheer! Turned out beautiful. Looks like a ton of work!! I am very happy to find your recipe. It sounds delicious and I am going to try it out this year for Christmas. 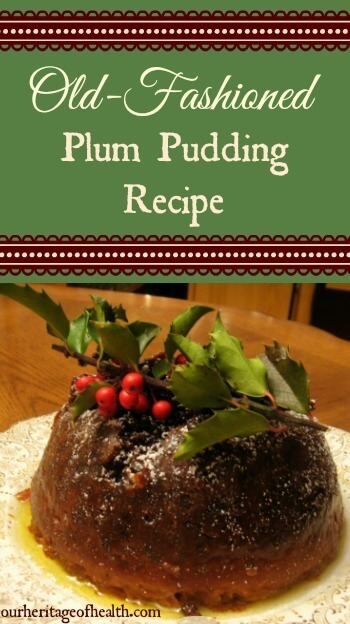 When cooking plum pudding my mom used to put pudding mix – about 2 cups per quart sealer..put lids on sealers & cook the pudding/jars in a canner of hot water..simmering it for hours….way easier cooking method..love this traditional plum pudding..your recipe is perfect. That does sound like an easier way. I’ll have to try that some time! This is such a cool article. I was reading Jung’s Synchronicity when he mentioned a story involved “coincidence” and plum pudding, and it occurred to me that it would make a great dessert for me to bring when my friend and I have our vintage dinner party. I love that you’re using good ingredients too, since I normally have to make my own adjustments when someone makes a recipe using corn oil or bleached flour or unnatural and processed ingredients ! Thanks for the history lesson, and the recipe ! not very nice. too heavy with butter and sugar. just not pleasant. I’m sorry to hear that you didn’t like the recipe. It’s not to everyone’s liking. Plum pudding is definitely a heavier dessert, and the butter and sugar do make it quite rich. That’s why it was usually reserved for holidays back in earlier centuries. If using suet how much would I use? Same as butter one cup? Yes, one cup of suet would be the right amount.